Dr. Fredrick Kateera is chief medical officer for Partners In Health in Rwanda, where PIH is known as Inshuti Mu Buzima, and a faculty member for the University of Global Health Equity in Rwanda. He has more than 10 years of experience in clinical care, research implementation, and program management in East Africa, with a doctorate in malaria epidemiology and training in immunology and immunogenetics. As Rwanda’s government launches its national plan to eliminate hepatitis C with a two-day symposium this week, Dr. Kateera describes PIH’s support, the country’s progress so far, and plans for the future. This week, Rwanda is launching its national plan to eliminate hepatitis C. As a Rwandan, I feel proud to say that this ever-more audacious country of mine will be the second African country, following Egypt, to tackle this issue at the national level. As a member of the Partners In Health family, I am even prouder to say that this has been part of PIH’s agenda in Rwanda for the past three years. Hepatitis C is a liver infection caused by the hepatitis C virus (HCV). In most cases, hepatitis C is chronic and — if untreated — can lead to liver complications, including cancer. No more than five years ago, in fact, hepatitis C was synonymous with cancer for Rwandans, who saw it as untreatable and leading to death. According to the WHO, about 71 million people worldwide are chronically infected with HCV. This is a major public health issue and is addressed in the WHO’s Sustainable Development Goals, which target the elimination of hepatitis C by 2030. In Rwanda, recent hepatitis campaigns show that the disease’s prevalence is 8 percent among people 15 and older, and 15 percent among people 45 and older. About 55,000 Rwandans are currently living with HCV, according to government estimates. The good news is that newer-generation drugs are more than 90 percent effective and carry only a few minor, reversible side effects. The bad news is that prices originally were about $1,000 per pill, and $84,000 for the complete dosage during 12 weeks of treatment. PIH and partners are fighting to bring those medicines to the country’s most vulnerable populations, for whom they otherwise would be too expensive, and to promote health care equity. Last year, in partnership with Rwanda Biomedical Center, the University of Rwanda, and Rwanda Military Hospitals, PIH led the implementation of the SHARED study, a research project in which patients were treated with a hepatitis C medication known as Harvoni. The study has had successful results, indicating not only that the drug is effective among Rwandans, but also that Rwanda’s health system has the laboratory capacity to follow up with patients and effectively monitor responses to treatment, all over the country. J.M.V. 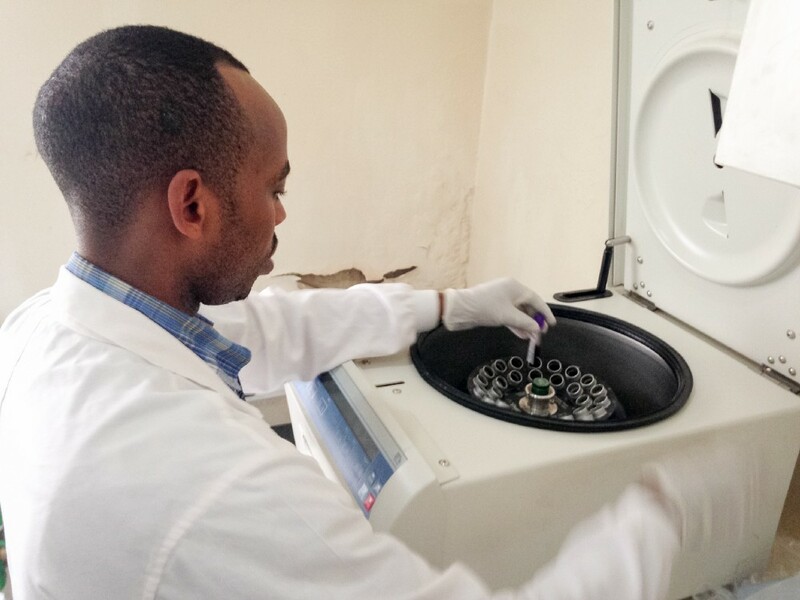 Halleluia, a laboratory technician working on Rwanda’s hepatitis C study, places samples for laboratory testing into a centrifuge. In Rwanda, PIH is proudly accompanying a progressive government. HCV screening, treatment, and follow-up appointments are available in public hospitals. The cost of the medication is largely covered by the Mutuelle de Sante, Rwanda’s innovative social health insurance program. So far, 700,000 people have been screened and 9,000 have been treated for hepatitis C.
Rwanda’s new national plan to eliminate hepatitis C is launching during this week’s symposium on December 11 and 12. Results from the SHARED study and from similar studies in Rwanda and the region will be presented. Global hepatitis C experts and key stakeholders, including the WHO, also will share their experiences. All of this information will guide implementation of Rwanda’s hepatitis C elimination campaign. We hope this process will serve as a great example of translational research, by bringing modern medicines into resource-limited settings and using data-driven evidence to inform national policy and practice. PIH is part of the national technical group and will continue to accompany the Ministry of Health to scale up hepatitis C care and contribute to its elimination. Together, we will defeat hepatitis C.
A local Ready-to-Use Therapeutic Food? Let's try!